If you are considering a digital piano of this type, the touch/feel is often the deciding factor. I say this because you don’t need the wooden cabinet of a digital piano to sound good. So, the playing experience it provides has to be good enough to convince you to choose a digital piano over a keyboard. The YDP-164 features a weighted key system Yamaha calls GH3 which is responsible for creating a realistic playing experience. To sum this up, “G” stands for graded which means the weight of the keys is graded from heavy to light. The bottom end of the keyboard is heaviest and the keys get gradually lighter as you move to higher notes. The “H” stands for hammer, which means they have a mechanism that mimics the weight of the hammers on acoustic pianos. The number “3” represents the 3 sensor configuration which senses the velocity and articulation of each key press. To use a simple example, let’s say you have 3 velocity levels which are soft, medium and hard. There is a lot of expression between soft and medium, so anything that helps accurately capture the most subtle nuances is a big deal. The 3 sensor configuration seems to do that very well and it feels like nothing is lost in translation when it comes to articulation, velocity, and expression. Overall, the GH3 system gets this digital piano off to a very good start. Another thing that adds to this realism is the synthetic ebony and ivory keys. The keys are covered in a synthetic material that creates the feel of a concert grand piano. Initially, this may seem like a minor detail but in combination with the weight, it’s a very nice touch. I mentioned earlier that the feel can be the deciding factor, but this is assuming all other things are equal. Whatever you are playing has to sound good or the feel doesn’t matter. 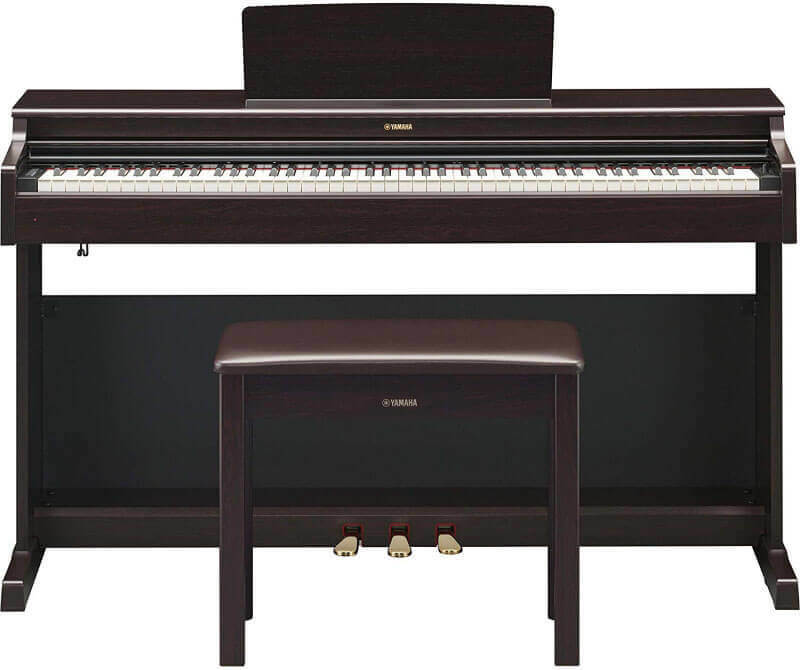 The YDP-164 is built around the sound of the Yamaha CFX 9′ concert grand piano. The same can be said about other models in the Arius range, however, it was newly sampled for the YDP-164. As far as choosing a piano to sample, the Yamaha CFX really is as good as it gets, especially for classical music. 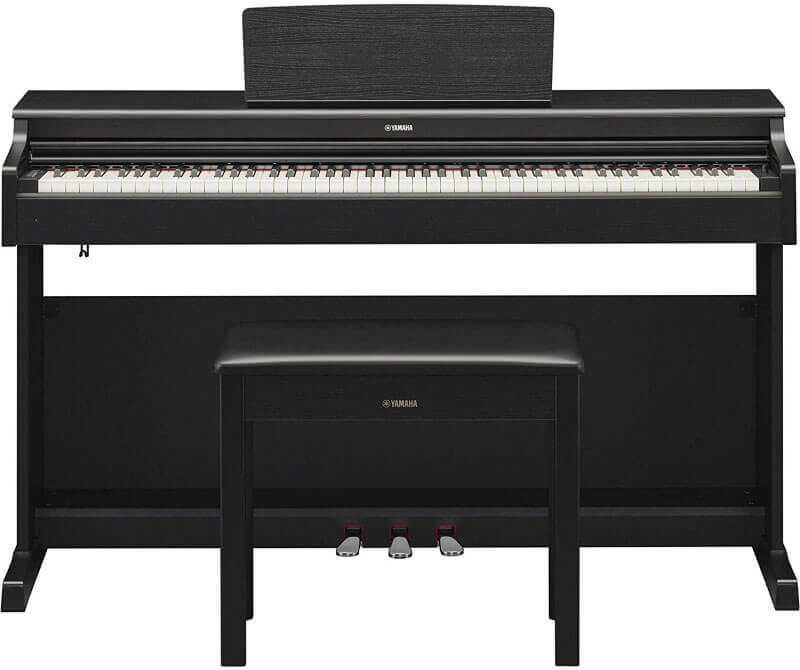 The CFX is an award-winning and highly sought after performance piano with faultless reviews. The YDP-164 offers with a degree of assurance when it comes to sound quality. Arius digital pianos have a proven track record of beautifully capturing the sound of the Yamaha CFX. There is no reason to assume the newly sampled sounds won’t meet or exceed the same high standard. When judging the sound of a digital piano I tend to focus more on the low range and high range. The reason I do this is that these are the areas that appear to be more difficult to digitally replicate. Quite often, digital pianos have a very nice mid-range but the bottom end sounds too hollow or it becomes too muddy. Similarly, the top end on many digital pianos can feel rather lifeless despite the mid-range being nice and clear. In this case, the YDP-164 has a beautifully organic sound. The combination of the CFX engine and GH3 keys create a really natural, expressive sound. The low-range is thick and lush but it maintains clarity and note distinction. This makes it great for runs, resonant anchor notes to create ambiance or ostinato bass lines. Basically, you get to utilize the low-range fully without anything sounding muddy or uncertain. The high-range is bright, vibrant and brings the keyboard to life. The top end cuts through beautifully at any velocity and rings out sounding clear and natural. In some digital pianos, it sounds like the low, mid, and high ranges are completely separate. While they each need to have their unique characteristics, the progression through the ranges must sound natural. This is something that I think the YDP-164 does particularly well. Yamaha has created a dedicated app called Smart Pianist, to be used with compatible digital pianos. The app lets you control many of the pianos functions from your smartphone or tablet. You can select voices, layer voices, adjust the keyboard split as well as controlling functions like transpose and pedal settings from the app. Smart Pianist also lets you change environment settings like the type and amount of reverb as well as record your playing. The app also has a play along feature so you can jam along with the music. How this works is that the app analyzes tracks from your music library then generates a chord chart for you to follow. This is a great feature for learning songs that you like but it also helps improve timing and develop your ability to play with other instruments. The app might struggle with tracks that are overly challenging harmonically, but for the most part, it will create accurate charts. The app connects either via cable or Wi-Fi. In any review, it’s good to have some comparison. Let’s start with the model that the YDP-164 was built to succeed, the YDP-163, and see what’s changed. Much of the changes are cosmetic, the YDP-163 is slightly smaller in height, lighter, and has a folding lid rather than sliding. On paper, it doesn’t look like much has changed but the differences are important ones. The YDP-164 boasts a newly designed speaker system that delivers the clearest, high-definition piano sound in the Arius range. The re-sampling of the CFX concert piano has only improved upon what was already a very high-quality sound. The HP601 from Roland is in the same price range as the YPD-164, around $1500. It has some similarities like synthetic ebony and ivory feel graded weight keys. However, I don’t think the feel is quite as convincing as the YPD-164. The biggest difference is that the HP601 offers a huge 319 sound presets where the YDP-164 only offers 10, making the Roland piano much more versatile. I have to say, as much as I love the sound from Roland’s superNATURAL engine, I think Yamaha has created the more realistic pure piano experience. Realistic piano playing experience – great touch/feel and weight of keys. Outstanding piano sound – The CFX sampled sound really delivers. Beautifully finished instrument – the choice of two high-quality cabinets look great in any home. The app can struggle with more complex music. Who Is the Yamaha YDP-164 for? In conclusion, I think the YDP-164 is an extremely high-quality digital piano. If you want more of an all-rounder then something like the Roland HP601 is a better choice. I’m of the opinion that if you want a digital piano it should be for the best pure piano experience, in which case the YDP-164 excels. Yamaha has clearly decided to focus on the main thing, the piano, and do it very well. For this reason, I would place the YDP-164 above most pianos at a similar price. This digital piano is for serious piano players, but I don’t just mean high-level players. If you are learning piano and want the luxury of a realistic piano feel with a volume control this is perfect for you. Likewise, if you are an experienced pianist with limited space at home, the YDP-164 is for you. Whatever level you are at if piano is your main focus then you can’t go far wrong with this.